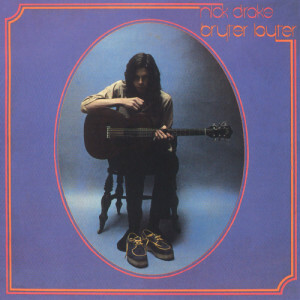 If you will bear with the analogy a bit, Nick Drake’s music in some ways represented an alternate path from that of Neil Young. Both artists represented ways of dealing with the failure of the 1960s counter-cultural movement. In Young’s case, he did two main things. One, he played scuzzy, grungy electric guitar in a way that scared off those not attuned to the counterculture. That approach proved difficult to maintain though the drug-fueled hedonism of the 1970s. He made a good go of it though! Second, he incorporated country music into his sound, suggesting that he looked for support beyond urban environs, toward the rural dispossessed. All these things had Young carving out a separate space away from mainstream culture. Nick Drake approached conventional pop music unabashedly. In a way, he was adapting to and working with mainstream pop. But he was also reformulating it. Bryter Layter, frequently described as an extension of his debut Five Leaves Left and the most hopeful of his three albums, comes closest to radio pop. But his attitude toward mainstream pop is to wonder about his place in it. His pop music innovation is his reflexive approach to it. Most of these songs are about the hope and promise of the future, approached with trepidation and uncertainty. Drake sings with a breathy, waif-like voice. He seems to pursue a very radical christian program of fighting his battles with weakness. But unlike Neil Young, Drake heads right for mainstream music with his deeply personal take on it. What links the two seemingly disparate performers is that neither can accept the extroverted world as it is. What differentiates them most is the lack of catharsis in Drake’s music — that is kind of the defining trait of Young’s music. Making music seems almost to deplete Drake, but he makes his music anyway. There are a few songs on this album that seem a bit saccharine: “At the Chime of a City Clock,” “Bryter Layter” and “Hazey Jane I.” But there are more that weave a richly compelling sonic fabric: “One of These Things First,” “Northern Sky,” and “Hazey Jane II.” Drake may have the qualities of a poor little rich kid, but his music also stands as an example of the best that can come of such circumstances. This isn’t Drake’s best album — that would be Pink Moon. It is still a pleasant one, and Drake doesn’t have a bad album to his name.